PracticeLink.com W INTER 2018 25 L E G A L M AT T E R S THIS PLACE IS AMAZING So is the difference YOU can make From the moment you walk into a Greenville Health System facility, you see the positive difference. It's in the friendly way we address each patient and employee. It's in the advanced technology and training centers that attract some of the finest professionals in the nation. It's in the strategic partnerships, the innovative teaching models and the invaluable learning opportunities that make GHS a best-in-class employer. 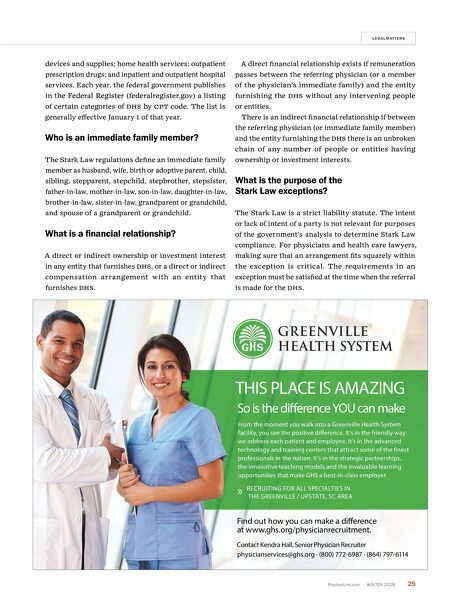 » RECRUITING FOR ALL SPECIALTIES IN THE GREENVILLE / UPSTATE, SC AREA Find out how you can make a difference at www.ghs.org/physicianrecruitment. Contact Kendra Hall, Senior Physician Recruiter physicianservices@ghs.org · (800) 772-6987 · (864) 797-6114 devices and supplies; home health services; outpatient prescription drugs; and inpatient and outpatient hospital services. Each year, the federal government publishes in the Federal Register (federalregister.gov) a listing of certain categories of D h S by CP t code. The list is generally effective January 1 of that year. Who is an immediate family member? The Stark Law regulations define an immediate family member as husband, wife, birth or adoptive parent, child, sibling, stepparent, stepchild, stepbrother, stepsister, father-in-law, mother-in-law, son-in-law, daughter-in-law, brother-in-law, sister-in-law, grandparent or grandchild, and spouse of a grandparent or grandchild. What is a financial relationship? A direct or indirect ownership or investment interest in any entity that furnishes D h S, or a direct or indirect compensation arrangement with an entity that furnishes D h S. A direct financial relationship exists if remuneration passes between the referring physician (or a member of the physician's immediate family) and the entity furnishing the D h S without any intervening people or entities. There is an indirect financial relationship if between the referring physician (or immediate family member) and the entity furnishing the D h S there is an unbroken chain of any number of people or entities having ownership or investment interests. What is the purpose of the Stark Law exceptions? 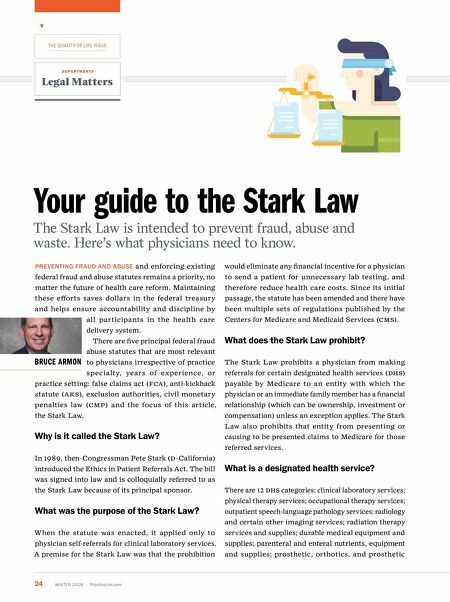 The Stark Law is a strict liability statute. The intent or lack of intent of a party is not relevant for purposes of the government's analysis to determine Stark Law compliance. For physicians and health care lawyers, making sure that an arrangement fits squarely within the exception is critical. The requirements in an exception must be satisfied at the time when the referral is made for the D h S.